Townsville may be small in comparison to some of Australia's major cities but it is no less significant. 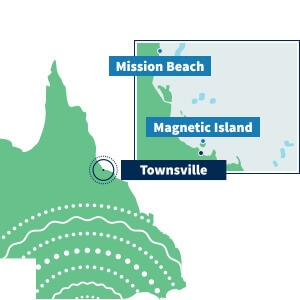 In-fact, to many Townsville is the capital of Northern Queensland! A major thoroughfare set against a backdrop of stunning scenery Townsville is perfectly situated as gateway to the Great Barrier Reef, Wet Tropics rainforest and Queensland epic outback. An easily accessible coastal destination Townsville is the perfect base for tours to the World Heritage listed Great Barrier Reef. There is an abundance of experiences to partake in from snorkelling and surfing to sailing tours and trips to Magnetic Island.